Ah, Image comics, my first (and probably forever) love. Kylie and Griffin have recently plunged me into the dark hole that is Batwoman comics, but never fear! No matter where else I go, I always come back to Indie comics like Image. Because to me, they do diverse, unique stories really well, and most of them science fiction or fantasy rather than strictly superhero oriented. I enjoy all of those things, especially if wrapped up in one neat package. Like the new teen graphic novel from Leila del Duca and Kit Seaton, AFAR. Set in a postindustrial desert landscape, 15-year-old Boetema discovers that she has the ability to astral project to other planets in her sleep. In one such jaunt, she accidently gets a young man injured. 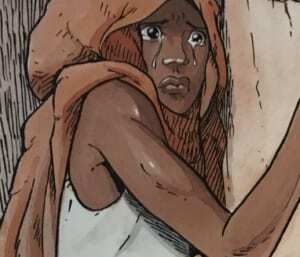 In waking life, her parents leave her and her 13-year-old brother Inotu, who is on the run from a cyborg bodyguard, to fend for themselves while they find temporary work as salt farmers. Bo must find a way both to protect herself and her brother as they flee to safety across the desert and to save, or at least help, the boy she injured while she ‘traveled’. Both siblings must learn to trust and have confidence in themselves, their abilities, and each other as they face new and frightening challenges without their parents. 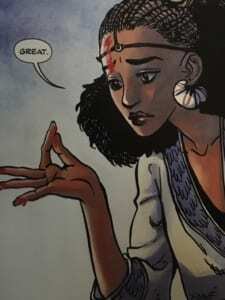 Remember when my fellow team Techno Wizards and I expressed a desire for more science fiction stories with afrofuturism in our book review of Binti? (Another delightful little tale you should read, incidentally) Well, AFAR delivers on that more than my wildest dreams could have imagined (heh). Come for the diverse, vivid, and beautifully drawn worlds and characters; stay for the moving sibling relationship and exploration of imagination as an escape from a chaotic home life. It’s a fun little story that reads a lot like a novella. Gripping but not dark, AFAR offers a delightful ‘taste’ of a rich, expansive universe that I would love to see more of in the future. You live in a desert, honey, shouldn’t you be more worried about water loss? Everything about the character of Boetema drew me in immediately. From her character design, to how she copes with her family situation, to her desire to escape via a vivid inner world. Though in this case, that inner world happens to be both read and actually an outer world, but still. Her dialogue and facial expressions in the first chapter convey the depth of her emotional and physical exhaustion coping with her parents’ neglect and abuse. You know right away that she’s the real parent of the family, always taking care of everyone, protective of her brother, and earnestly desirous of undoing the accidental damage she did while planet hopping in her sleep. If you’re a child of a chaotic home, Bo’s “I’m going to try and fix things” is deeply relatable. And that might as well be the mantra of her life. The tension between her ‘inner’ and outer struggles makes for compelling story fodder. She’s navigating an incredibly complicated experience in learning about astral projecting with no guidance as the story opens. She’s trying to escape her bodily existence and home but does not realize the repercussions of stepping into someone else’s life without context. It reminds me of Steven astral projecting into Lars in “The New Lars (Steven Universe 3.10) and trying to help him only to end up complicated Lars’ life instead. Her brother Inotu is no less compelling. I latched onto his feeling of betrayal at learning Boetema planned to escape home without him instantly. I share Boetema’s impulse to escape internally, but I was also the youngest sibling in a chaotic home with a rebellious older sister. She chose to stay away from home as much as possible, and I resented it. I felt Inotu’s cry of betrayal, his anger, his frustration. “How could you leave me behind?” is a question that still hangs between my sister and I because, unlike Inotu and Boetema, we never talked it out. Even aside from this, Inotu’s journey to self-confidence is one many teenagers can relate to. He’s not as naturally intelligent, quick, or book minded as his sister. He has to work harder to understand grammar and writing, but we get to see him grow in that throughout the story. He’s warm, big-hearted, and courageous underneath his lack of self-confidence. He stands up for the weak, and his more emotional personality contrasts well with Bo’s practicality. What would feel like an overly gendered dichotomy in a story with white protagonists—book smart and hard working Bo alongside naturally gifted engineer Inotu—feels fresh and new with a pair of black siblings. Women of color are so rarely given the space to be The Smart One, and men of color the space to be both emotional and skilled with their hands. And while the siblings do eventually settle into jobs that don’t entirely reflect these skillsets, they’re still teenagers trying to get by, and we can see a bright future for them as a scribe and engineer. At least that’s my headcanon for them. One of the things I appreciate most about the dynamic between Inotu and Bo is the difference in how they approach their chaotic home life. Bo, the elder, plans to run away while using her dreams to find a different escape. We know from the opening pages that she blames her father for all their family troubles and likely resents her mother. Who can blame her? Their father is a drunk, violent man whose serial lies force them to move frequently. Their mother, an unprofitable artist, suffers from depression that leads her to neglect her children. (It should be noted that she is also a victim, given Inotu’s statement, “Dad mean to Boetema too”, emphasis mine). If this weren’t enough, Bo and Inotu’s parents abandon them to fend for themselves for three months while they go find work. The promise to send money home (and eventually send for them), feels like a hollow one. It’s heartbreaking. Small wonder Bo finds escape through exploring other worlds, especially when, as their father plans the family’s future chapter one, Bo is conspicuously left out. But hers is not the only coping mechanism on display. As is true with chaotic homes, each of the children respond differently. Inotu’s different experience in the home leads to a different reaction. He hides being locked up from Bo, taking a great deal of pressure on himself so as not to burden her further. He’s also much more emotionally attached to his parents despite their very real flaws. And you know what? That’s real, too. Not all children of abusive and neglectful parents want to run away; some deeply love their parents and do not want to burn bridges. The scene where Inotu confronts Bo about her plans to escape without him was powerful and raw. I identify strongly with Inotu’s desire to still love his family as well as his feeling betrayed and uncared for because of her desire to escape their unhealthy household. At the same time, I have strong sympathy for Bo in her desire to escape. I love that the story created space for both perspectives to exist and clearly paints them both as coping the best they can. I also love seeing Inotu speak up for himself and that the conversation led to reconciliation and a stronger bond of trust between the siblings. Because their trust in each other is what holds this whole story together. Bo draws Inotu out and supports him as he gains confidence in himself. Inotu grounds Bo and prevents her from wholly detaching from either her planet or her family. They rescue each other throughout the course of the story, and we know neither would be able to get far without the other. This stands alongside the intertwining narratives of Bo helping rescue Lindu’s people and Inotu helping rescue Bo from prison, highlighting the value of both giving and receiving help. AFAR manages to handle heavy issues like substance addition, neglectful parents, and accidentally hurting others in the process of escaping a dysfunctional home without becoming Dark. It’s lighter in tone than Supergirl: Being Super, and that’s more than okay with me. Like Steven Universe, it’s approachable enough that I’d even say it could be read by middle school or even elementary school aged kids. It’s also damn engrossing. The worldbuilding is expansive; the glimpses we get of the postindustrial society, fascinating. Like the Tardis, the pages of this graphic novel felt bigger on the inside, broader. I could inhabit this world for a long time and not get bored. The only characters in positions of power we meet are women of color. Bits of dialogue like “oh my gods” or “universal spirit traveler” add flourish. 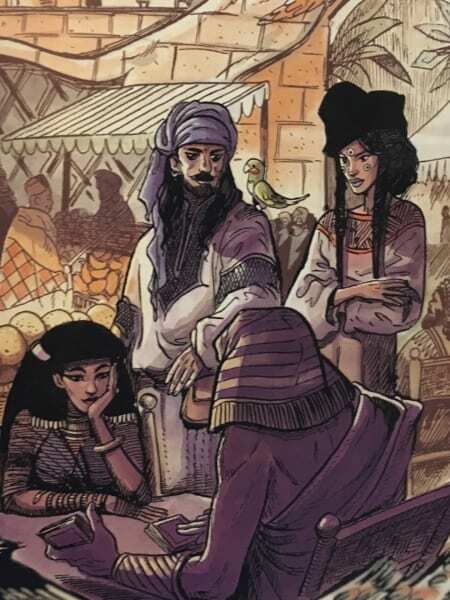 The mix of Egyptian, Nubian, and multiple other African cultures with splashes of Chinese, Bedouin, and even Indian culture implied a wider world beyond the desert Bo and Inotu call home. It’s the little details like this that catch my eye, the commitment to creating something wholly different, yet familiar. I really liked the concept that Bo can only astral project into the bodies of other ‘travelers’. Not only does this neatly sidestep the concern with using anyone’s body for one’s own purposes, it also expands scope of the universe. When we learn this halfway through, suddenly all Bo’s early, brief jaunts into various bodies become new story avenues to explore. Do any of these characters know they can astral project, too? What would their journey look like? Bo’s accidental intrusions become doorways for these characters to explore their own power in universe and for the reader to imagine it. The detail put into the visual storytelling as well as the written dialogues leaps from the page. Something as simple as both siblings starting their journey with a broken stick generates an aura of intentionality about every detail, no matter how minor. Such as the use Del Duca and Seaton make of silence to focus on the visual element. The color palette is lovely and atmospheric. Warm, autumnal tones for the day time in the desert and cool blues and greys for the night. Every planet Bo visits has it’s own palette that differs from hers, too. And let me tell you about the aesthetic. No, I’ll do you one better, I’ll show you. I love every single bit of this. The art and iconography in this world is refreshingly diverse and varied. There’s only one white character to be seen, and she’s only in one panel (her name is Gretchen, btw, which is amazing). And the other planets! Good lord are they bright and colorful. Even the smallest of snapshots into a new planet feels like something I’d like to spend more time in. I read and watch a lot of science fiction, so I’ve seen all kinds of aliens. But the ones in AFAR are by far some of the most intriguing, especially since most of them are not humanoid and bipedal. Against the early backdrop of the desert, visiting each new planet feels like biting into a fresh, juicy peach on a hot summer’s day. The email correspondence mixed with concept art is a fun little gem at the back of the book. It’s also a fascinating insight into the process of making comics and graphic novels. If you read this, definitely check out the page where they discuss the development of the marketplace image I pointed out above. Seaton’s notes all over it are pretty funny. As a completely off topic side note, Bo looks almost exactly the way I headcanon Hermione Granger to look, and one of the other characters looks like Holtzmann from Ghostbusters. Props for that, Seaon, even if it was unintentional. As a linguist, I enjoy the inclusion of Inotu learning how to write. His mistakes are the kind you’d expect for his level of writing comprehension. However, there’s a bit of a disconnect between his speaking versus his writing skills. If he understands grammar enough to speak well, he likely wouldn’t have the issues he does in his writing. He’d have spelling and punctuation mistakes, sure. But, if he were having the kind of trouble with tenses that we see in his writing, it would show up in his speaking, too. Perhaps he’s learning to write a different language than he speaks, but if so, that’s not clear. Still, his writing gets better over time, and I like seeing that change. It marks his progress as a character as well as the passage of time. My only other nitpick is that I was a bit confused by the scene where Inotu gets sucked up into the fan (?). I had to reread it twice to understand the action going on, and I’m still not entirely certain. Overall, it doesn’t detract from my enjoyment, but it did stick out. Likewise with a couple of scenes that got a bit info dump-y. Could the dialogue have been adapted to be less “here is some exposition”? Sure, but it didn’t feel like a pervasive issue with the writing. 9/10, any nitpicks I have are minor blips on the radar of an otherwise excellent story with beautiful art that brings out the best of the narrative. I finished the story wishing I could see more of this world, like Lindu’s own awakening into her powers, or her and Bo meeting in the ‘spirit world’. I’d devour a comic devoted to Abrinet and her brother, too. Dear Image, can you ask Del Duca and Seaton to turn this into a series? Thanks.